Opposition supporter receives 2-year sentence for repeated protests. The first individual has been jailed under a new law in Russia aimed at punishing those found guilty of breaching rules on public assembly. 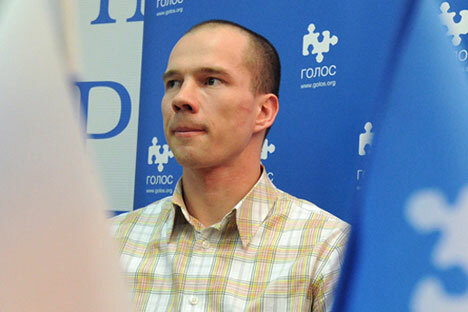 Opposition activist Ildar Dadin was sentenced on Dec. 7 in Moscow to three years in prison after being found guilty of repeated violations during rallies. At the same time, the prosecutor asked for less severe punishment for Dadin than the judge handed out to him – two years in prison. Dadin refused to plead guilty; his defense intends to appeal the verdict. Dadin repeatedly held protests in support of Ukraine without getting permission from the Moscow authorities (on Aug. 6 and 23, Sept. 13 and Dec. 5, 2014, etc.) in which he, along with other protesters, allegedly blocked streets, obstructed traffic and ignited pyrotechnics. On Jan. 15, 2015, Dadin and about 100 other protesters took to Moscow's Manezhnaya Square to demand the verdict against opposition figurehead Alexei Navalny in the so-called Yves Rocher case be overturned. As a result of the protest, Dadin received 15 days in prison on charges of disobeying police orders. The human rights organization Amnesty International has urged the Russian authorities to release Dadin. The law punishing "Repeated violations of the established order of organizing or holding assemblies, rallies, demonstrations, marches or picketing" was added to the Criminal Code in the summer of 2014. The maximum penalty for the offense is a five-year jail term.